As every Friday, we have a suggestion for artlovers to enjoy the weekend even better than usual. This time, the city is Madrid and the place, La Casa Encendida. ARSTRONOMY. Incursiones en el cosmos is a collective exhibition that explores the influence of scientific research, space trips and science fiction in contemporary art through the work of international artist from the 50's such as Keith Haring, Susan Hiller, Mike Kelley, William Kentridge and Yves Klein. ARSTRONOMY bring us the obsession of Humanity to reach the unknown in more than twenty artworks: photography, videoart, painting and sculpture are the language to show that kind of shaking hands, that meeting between science and art that will be open until Sunday, 30th in La Casa Encendida. We know you are going to love it! This week is commited to the ending of the cultural season and the summer agenda for events. That is why you need to hurry to see this little short review of the must-see exhibitions. So let's go! At 21er Haus in Vienna, Tomás Saraceno's 'Becoming Aerosolar' is a brave call for attention about sustainability in that slight frontier he use to walk in his work, always between art and science. And also in Barcelona, this time at MACBA, the most controversial exhibition of the season, 'The Beast and the Sovereign' which carried forward the curators as well as the director of the museum, will be finishing on sunday. Also in Vienna, at the Albertina Museum, we will be seeing 'Black&White', a review of the graphic art collection of the museum, with more than 10,000 artworks, that now are selected for this special show. As a final highlight we must remark this season exhibit at Tate Britain: a multisensorial experience called 'TATE Sensorium' that comes as a suggestion to enjoy and reinterpretate through the eye, the ear and the taste some selected masterpieces of the best british modern art. We are sure you could suggest some other hot spots for artlovers this week. Let us know your suggestions on our social media and do not forget to download our app. You will be finding new institutions, new exhibitions and many other new stuff, as usual only 100% official content. C-Mine new app is out with CloudGuide! C-Mine is a new experience, more than a regular simple museum. It will take you to the time where the coalminers worked underground and created a community, a little city in the centre of the Flemish town of Genk. C-Mine is a learning experience specially dedicated to families and students of the industrial engineering from the local university that have even a special space for workshops there. The Industrial heritage of Gent is now shown in C-Mine throught two tour guides by CloudGuide: C-Mine Guide and C-Mine Expeditie, both permanent exhibitions to be enjoyed in our free app for visitors, as usual, for Iphone and Android. One more week, we are bringing you more news to help you finding your best choice and plan your summer days in a better way. We have been working on your comments and reviews: as you refer to be interested on knowing what's happening in the city you arrive to while traveling, here it comes a brief agenda full of international events and exhibitions to enjoy with family, friends and children. And how could be forget to tell you about the star draw of the summer! We want you to have one of the 3 artickets we are raffling until august the 16th because we know you are an artlover and really need to visit the best 6 museums in Barcelona for free and without queuing! Museu Nacional d'Art de Catalunya MNAC, MACBA, CCCB, Fundació Tàpies, Fundació Miró and Museu Picasso are waiting for you! Just download the app and register at My CloudGuide. We will announce the winners soon! 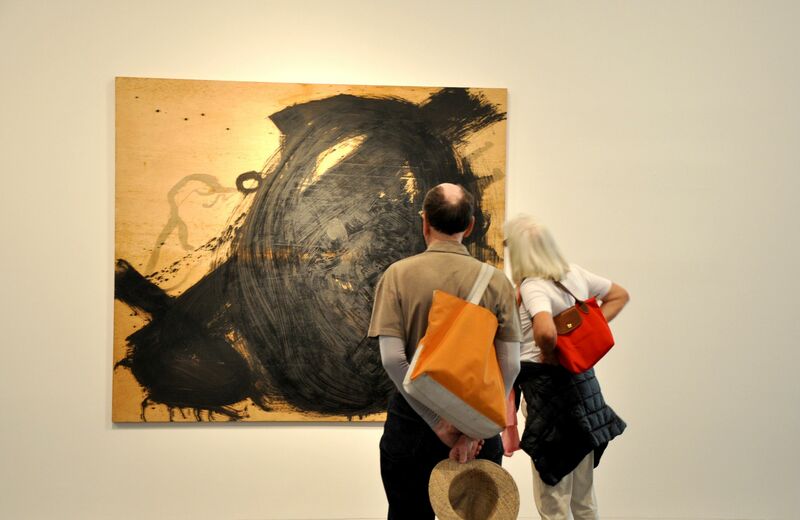 Fundació Tapies will be celebrating their 25th anniversary with the opening of Tapies. Artist Collection. An exhibition that joins a wide selection of the exhibits loaned by Antoni Tapies to his heirs together with his own private collection made with some the most vanguardist contemporary artists such as Picasso, Klee, Kandisnki, Miró and Pollock. The exhibition, curated by Núria Homs is a dialogue between genius along the decades of the 40's to final 80's that is completed with personal letters, pictures, invitations, catalogues and books such as Paul Klee diary, a special edition of Max Ernst La Femme 100 têtes or a selection of Marcel Duchamp working documents. As complementary activities, there will be courses, conferences and workshops as well as guided visits to all the audiences with an special nod to those who are 25 during 2015, who will have an open access along the year. Besides, every sunday the museum will open doors for free to enjoy the exhibition. This remarcable effort to engage audiences to the wide heritage of this catalan and universal artist comes even stronger by the recently published CloudGuide app, available for free as well for Android and iOS.